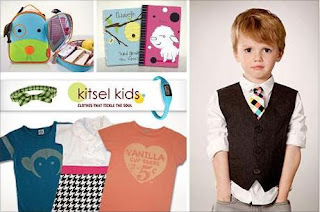 Get $15 for $30 worth of clothes, accessories, and books from Urban Bratz, Kidorable, and more at KitselKids.com! Update your family's wardrobe for summer or give a voucher to expecting or new parents as a fun gift. The range of products on the site is impressive - adorable t-shirts, rain gear, personalized coloring books, jewelry, diaper bags, onesies, wall decor and so much more! New members can get this for just $12 when they use their $3 first time buyer credit. **Plus they are offering a limited time promo code on this Save. The first 250 customers can get $3 off this deal when they enter the promo code KIDS at checkout. This makes the deal just $12 for current members and $9 for new members. Take advantage of this code before the limit is reached!